Download Haley’s new song “Show Me Your Moves” …soon! There is only 3 days left for Haley’s new music video campaign on Indiegogo.com. 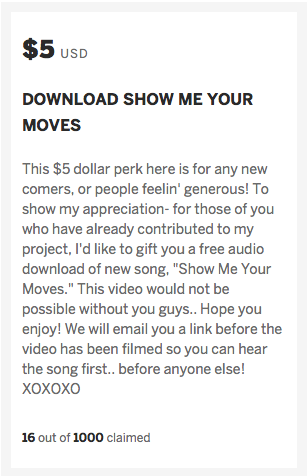 She just added a new perk, for those who haven’t donated to the campaign yet, you can pay $5 and receive a download of the song before the music video is filmed! For everyone who has already contributed to the campaign, everyone receives a free download of the song as well! This means we will be hearing the song sometime next month. Haley stated on Twitter they plan on filming the video during May sometime. Donate to her campaign before it’s over here!